The network-ready Samsung SCX-4833FR is a multitasking monochrome laser printer that also has copying, scanning and faxing capabilities. The Samsung SCX-4833FR all-in-one is ideal for small offices or workgroups with high-volume printing needs. It has a monthly duty cycle of 50,000 pages and it can handle 800 sheets at a time. The Samsung SCX-4833FR also has an eco-button to help lower running costs. Print resolution can go as high as 1200 x 1200 dpi while the scanner has a maximum resolution of 4800 x 4800 dpi. The SCX-4833FR printer may be a bit pricey; it does not offer Wi-Fi, even as an option. The compact and modern Samsung SCX-4833FR printer measures 469 x 438 x 477 mm and weighs 16.5 kg. There are 3 paper trays at the bottom and an automatic document feeder on the scanner. On the control panel are function buttons and a 4-line graphic LCD display. For connectivity, the SCX-4833FR Samsung multifunction printer has Ethernet and USB ports located at the back. The Samsung SCX-4833FR mono laser multifunction printer has a duplexer for automatic double-sided printing. It also offers a scan to email, USB memory, PC and FTP function. 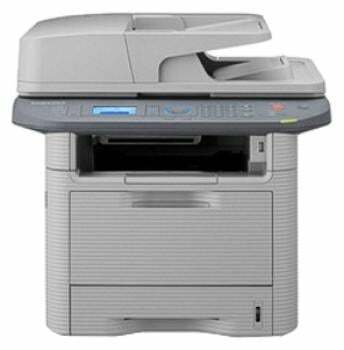 The Samsung SCX4833FR laser printer delivers excellent output at a quick speed. It is easy to use and install plus it works on Macintosh, Windows and Linux computers. The black Samsung SCX-4833FR toner cartridges are easy to install and the high capacity Samsung SCX4833FR printer cartridge delivers a low cost-per-page with its capacity of approximately 5,000 pages. Expect the Samsung SCX-4833FR mono multifunction printer to be a bit pricey. Though Ethernet is available, Wi-Fi is not supported.